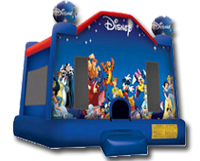 With the overwhelming success of our Mickey Park Bounce House, we have added another great FULL THEMED unit to our inventory. You have all the characters from Disney World. From Dumbo to Tigger to Pinocchio and of course Mickey and Minnie Mouse. This is a 15′ x 15′ bounce house, not the smaller units that other companies carry which is a 13′ x 13′. No matter what themed of Disney you are looking for, the World of Disney is the perfect fit to any party.